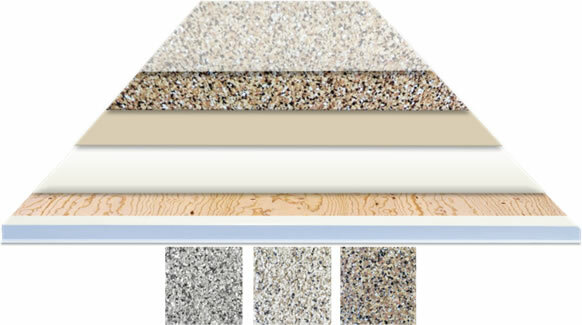 100% waterproof base coat installed over substrate (concrete, plywood or existing membrane) topped with back-rolled silica sand and Flexstone's one-part aliphatic colour coat (UV Stable). 100% waterproof solvent-free base coat installed over substrate. Aromatic colour coat rolled atop of base - decorative acrylic flakes broadcasted into wet top coat. Final coat is a 1 part UV stable urethane clear coat. 2 Part Epoxy primer/sealer installed over concrete. 100% waterproof base coat rolled over primer. 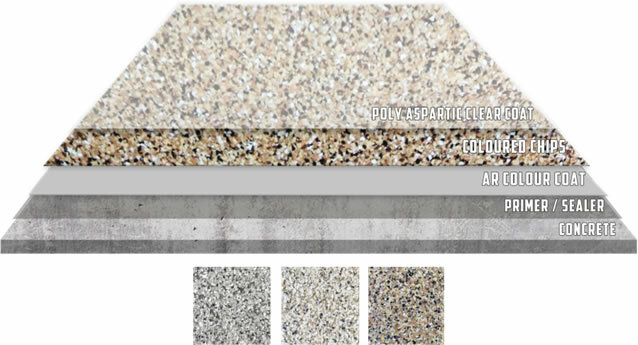 Aromatic colour coat rolled over with backrolled or broadcasted silica sand. Final coat is a rugged aliphatic colour coat.